The Cleveland Browns drafted rookie Baker Mayfield with the hope he’d be their quarterback of the future. As a result, some fans would prefer he be the team’s starter come Week 1. That the Browns instead continue insisting Tyrod Taylor is their starting quarterback is seen by more than a few people as a letdown. Sure, I’m just as eager to see what Mayfield can do, just as anxious to find out if he can bring an end to the carousel of failed quarterbacks this team has endured. That said, Taylor starting over him come the season opener isn’t something to be upset about. This is mainly due to the fact the vet is earning the job. We’ve heard nothing but good things about Taylor throughout OTAs and minicamp. Coaches are raving about him on a daily basis. Cleveland beat writers are quick to note how well he’s looked on the field. 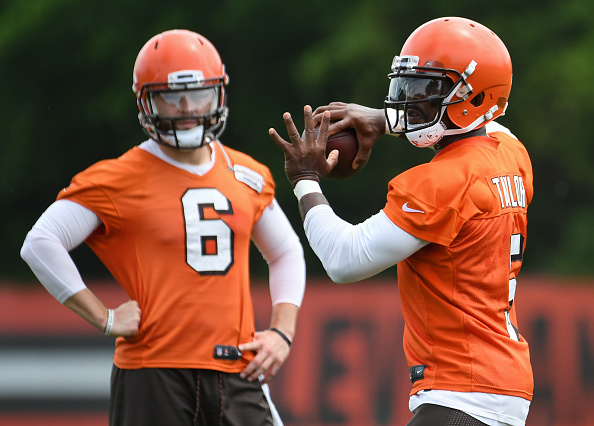 Taylor’s teammates – including Mayfield – can’t stop heaping praise his way, constantly bringing up his work ethic and the effort he’s putting in. To sum it up, Taylor isn’t making the team look dumb for tabbing him as the starter back in March. Again, as intrigued as I am about Mayfield, we’re talking about a team which has won one football game in two years. A team which hasn’t seen competent quarterback play since the Reagan administration. A team which has spent the past two decades as the NFL‘s resident sideshow. So, if Mayfield is kept on the second string not because the coaches are being stubborn, but instead because Taylor has looked much better, it’s tough to see this as anything but positive. It’s positive because it means, for the first time in what feels like forever, a Browns quarterback is starting because he actually deserves to. He’s not being labeled QB1 simply because he’s the veteran and that’s that. The team isn’t starting him despite poor performance on the practice field. Cleveland instead made him the starter, and he’s since proven this is the right move to make. It’s positive because the Browns don’t feel forced to fast-track Mayfield. We don’t have to hope an unprepared rookie will quickly adapt to the speed of the NFL because the team has no choice. Mayfield isn’t competing against veterans who clearly aren’t what you’d call legit starters (see: Osweiler, Brock). Additionally, he can continue getting up to speed without the pressure of needing to be ready by Week 1. To be clear, I’m not saying Taylor is the long-term answer at quarterback. I’d still bet on him playing elsewhere next year as Cleveland hands the reins to Mayfield. At the same time, since when can Browns fans be picky about which quarterback they want starting for this team? Since when can we be upset about a player actually looking like a capable starting QB? The last quarterback to win a game for this team was Robert Griffin III. Before that, Johnny Manziel. Last year, the Browns started rookie DeShone Kizer not because he earned the job, but because he was the least awful option. This team badly needs to find a quarterback who’s able to win games, and do so consistently. If Taylor gives Cleveland fits the bill – and everything we’ve seen so far points to this being the case – he should start. No questions asked. Mayfield may still be the future. He may find himself starting at some point this season. Hell, he may even surprise everyone and steal the job from Taylor during the preseason. Still, after everything this team has gone through at the quarterback position over the past two decades, can’t we just embrace the fact there’s an actual plan in place? One which, for now, looks like it’s working? Taylor being under center come Week 1 may underwhelm many fans. However, if he’s there because he earned it, because he genuinely gives Cleveland the best chance to win, you won’t hear any complaints from me. I’d like to think everyone else would eventually feel the same way.